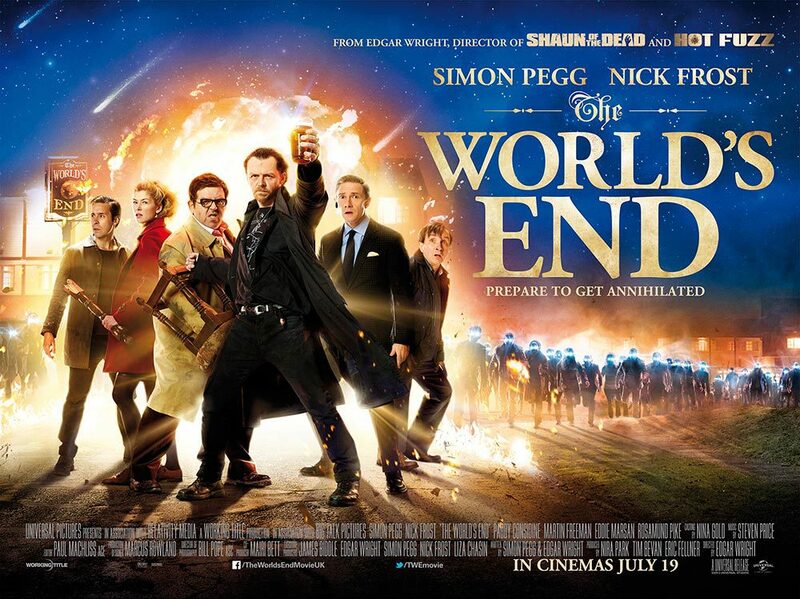 The final instalment in the so called ‘Cornetto Trilogy’, ‘The World’s End’ is culmination of Simon Pegg, Nick Frost and director Edgar Wright’s previous work. Despite indulging heavily in the last two films, it manages to be both pleasantly familiar while adding enough novelty to be more than a worthy addition to their filmography. Pegg and Wright do what they do best, taking conventional film plots and injecting them with a healthy dose of Englishness with debatably the best, most meaningful results yet. Gary King (Simon Pegg) is a middle aged waster- an alcoholic and still dressing like his high school self in his leather trench coat, desperately clinging on to the past. One day at an Alcoholics Anonymous Gary retells the glorious story of how he and his four mates attempted the infamous ‘Golden Mile’ pub crawl on the last day of school in their sleepy hometown of Newton Haven. Failing to drink the required 12 pints and reach the last pub, The World’s End, inspires Gary to round up the gang 20 years on to finally complete the ‘Golden Mile’. Having assembled all his old mates; Andy (Nick Frost), Peter (Eddie Marsan), Oliver (Martin Freeman) and Steven (Paddy Considine), who have all annoyingly grown up and selfishly got real jobs they reluctantly agree to join Gary to complete the boozing marathon and catch up on their lost years. While Gary revels in the past, the others are less than chuffed to be back enduring his childish exuberance, none more so than Andy who has become teetotal ever since ‘The Accident’, unexplained but involving Gary in some capacity. Just as tempers start to flair and Gary’s lies come back to haunt him in pub three, ‘The Crossed Hands’, something begins to seem out of place in their hometown. What transpires is that Stepford Wives-esq people have replaced the townsfolk for reasons unclear to the gang, what is clear though is that Gary must finish the pub crawl regardless of the strange happenings. What makes ‘The World’s End’ such a success is down to the fact it’s so easy to relate to, being embedded so strongly in everything quintessentially English. The whole notion of pub crawls is one of England’s great joys; in fact the pub itself is one of the cornerstones this wonderful nation was built on. The trilogy’s previous two films have dabbled in using the pub as backdrop but only in ‘The World’s End’ is it utilised as central to the whole film. While functioning as a lovely familiar setting for the film there is a deeper look at the state of the country’s local boozers- touching on the growth of chain pubs, the unforgettable clientele and the memories that linger in them, in Gary’s case his one night stands in the disabled toilet. Intrinsically linked to pubs is a certain amount of nostalgia which lies at the heart of Gary and the film’s plight. ‘The World’s End’ is as funny and action packed as ‘Shaun of the Dead’ and ‘Hot Fuzz’ but manages to add a new dimension to the winning formula by addressing some serious, adult issues. Gary’s immature behaviour is overtly hilarious yet his situation is desperately sad at face value, he’s a middle aged alcoholic and drug abuser with no career, friends or future meaning his only happiness stems from his yearning to relive past glories. Not really that funny in hindsight. Luckily the film tackles Gary’s problems, and the wider issues of clinging on to nostalgia, with a large dose of humour punctuated with a necessary level of gravitas needed to elevate the topics beyond a trivial attempt at a deeper narrative. It may not be gritty, bleak kitchen sink realism but it’s a welcome extra layer of depth which raises it above its previous incarnations. As expected Pegg and Frost once again deliver their trademark combination of comedy and action. The laughs may not be as raucous as ‘Hot Fuzz’ but there is a constant stream of snigger inducing jokes as Gary and co bicker and banter with each other throughout. In fact much of the film’s comic success is due to the British all-star casts on screen chemistry and the fact you can see your own mates in them. The film’s measured start allows enough time for each of gang’s character and quirky traits to be explored adequately, giving them all their own personality in the film. Unsurprisingly as the film proceeds Gary and Andy become the film’s focus which is a bit of a shame as it relegates the supporting cast to the periphery, but while they are all on screen the witty script shines through best. On top of the central quintet is an A-Z of British actors you recognise from other things but can’t quite put your finger on who or where. Cameos from Michael Smiley, Reece Shearsmith and Pierce Brosnan to name a few are all welcome sights, adding to that warming sense of familiarity at the heart of Wright’s directorial pictures. Wright, Frost and Pegg may have achieved their most complete film in the trilogy with ‘The World’s End’, the aforementioned successes are supplemented with slick and seamless action in just the right amount, a miniscule love story and an absolutely stellar soundtrack that embodies Gary’s 90s youth- think Stone Roses, Pulp and the Happy Mondays. The only criticism that can be levelled at the film is the finale which fills rushed, jumbled and frankly a bit rubbish. The sensationalist story can be excused but the floundering explanations are a bit embarrassing and really are the film’s downfall, it doesn’t ruin all the prior good work but it is a sour note to end on. Looking back on the film it may be rash to call it the best in the ‘Cornetto Trilogy’ (Mint is the flavour this time in case you wondered) but at this point in time it’s probably true. Combining all the best elements of the first two episodes ‘The World’s End’ adds an extra dimension of interest to proceedings by tackling some familiar trivial issues, but also graver problems through Gary’s tragic character. Funny, action packed and most importantly set almost entirely in pubs you would have to be a pretty strange miserable Englishman not to take any enjoyment out of the film, if nothing else it makes you proud to be English and have the great institutions of public houses pouring lovely pints of bitter. Ah man, this film was such a let down, so gutted! Poor, poor jokes, awful plot line and all the “best” bits were shown in the trailer. I don’t think I even laughed out loud once! And come on, what on earth was that ending about?! Glad we can at least agree there. Though by the looks of the rating on Rotten Tomatoes, it seems I’m alone in this opinion. They certainly peaked with Hot Fuzz, which remains an absolute classic in my eyes! A good, really well written review though Jonny, enjoyed reading and hearing your thoughts about it!